Test your smarts on pre-seed weed control. Step one in the pre-seed weed control plan is to see what weeds are present — annuals, perennials, winter annuals — and at what numbers. Choose a product based on which weeds present the biggest threat to yield based on their number and size. Around 90% of Canadian canola is exported, and our customers have high standards when it comes to clean seed, oil and meal. It is essential that all growers, agronomists and retailers do not use or promote unregistered pesticides or those with unacceptable residues. 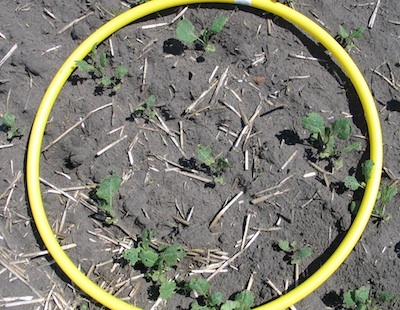 Here are three important points to follow before using a product on canola…. While growers wait to hit the fields, this is a good time to pull out the drill and give it a good inspection. A large flat concrete pad is ideal for leveling. Growers can have soils tested for low-level presence of clubroot at Manitoba’s new Pest Surveillance Initiative (PSI) molecular detection laboratory. For growers who want to keep things simple, a standard seeding rate of 5 lb./ac. should meet the basic needs of stand establishment — as long as all other steps for a good stand are followed. Growers who want a seeding rate that establishes 7 to 10 plants per square foot — 4 plants is about the minimum but you should add a few extra plants for a safety cushion — will want to adjust the seeding rate based on seeding date (cool soils may require a higher seeding rate given the likelihood of higher seeding mortality) and thousand seed weight. Read how to do that.